Shanghai (AFP) - Russian teenager Julia Lipnitskaia scored a 69.56 to light up the opening day of the Cup of China Grand Prix event on Friday. 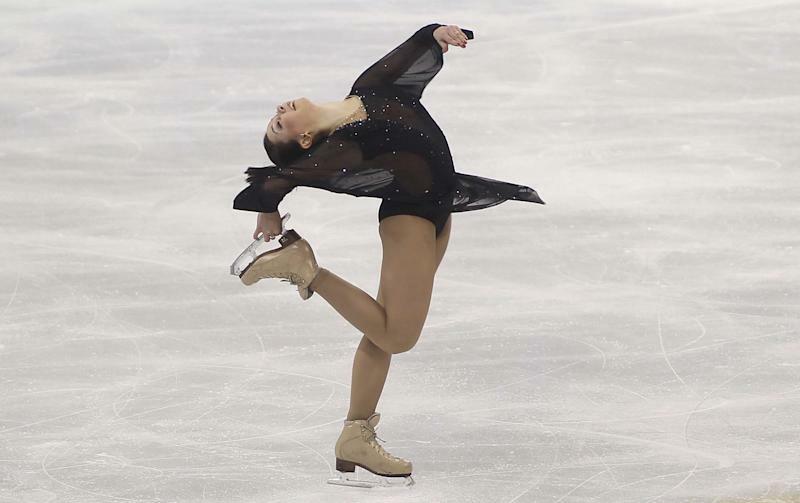 Months after becoming the youngest modern skater to win Olympic gold, the 16-year-old immediately landed a triple toe-triple toe loop at the beginning of her program. "I was really nervous training and it felt like it was my first competition, so I'm very pleased with the results," she said. Trailing right behind her with 67.99 points is teammate Elizaveta Tuktamysheva, who continues her hot start to the season, which includes three Challenger series event victories and a silver medal finish at last month's Skate America. 2014 Four Continents winner Kanako Murakami of Japan is in third after scoring a 60.44 on her 20th birthday. In ice dance, Skate America runner-ups Maia Shibutani and Alex Shibutani scored 65.20 points dancing flamenco to "Asturias Variations" and pasa doble to "The Last Corrida". It was enough to keep them ahead of current world champions Anna Cappellini and Luca Lanotte of Italy, who finished second with a 62.70 score in their season debut. After finishing runner-up at last year's event, Russia's Maxim Kovtun currently leads the men's race. He scored an 85.96 after landing a quadruple sow-cow to triple loop and a quadruple toe loop. However, he stumbled while doing a double axel. "Today I landed two quads which didn't work so well in practice, but I was able to execute in the programme," he said. "The opposite was true with the axel. When I return to Moscow, we will look at changing the program. My coach said I could do better and I agree." Neither of his closest competitors were especially pleased with their results. In his season debut, world champion and Olympic gold medallist Yuzuru Hanyu scored an 82.95. In third is China's Yan Han, who became the first singles skater from the host country to win the event last year." "I didn't skate my best," he said. "I don't think it was a good idea to start the season with the Grand Prix. I should have taken part in the national games." It wasn't all bad news for China, who will look to complete a sweep of the Pairs category tomorrow. Three-time national champions Peng Cheng and Zhang Hao currently lead with 69.11, after finishing third at Skate America. "Performing before a home crowd brings pressure and motivation," Zhang said. "We were very pleased to have our best performance today." Fifty-four of the world's best figure skaters from twelve countries are competing in the Cup of China, which is the third leg of the six-stop Grand Prix series. Skaters are looking to gather points and medals to reach the finale in Barcelona, Spain in December. Many will return to Shanghai next March to take place in the World Figure Skating Championships, the first time in history that the event will take place in China.